Comments: Comments Off on What should Cardale Jones do? 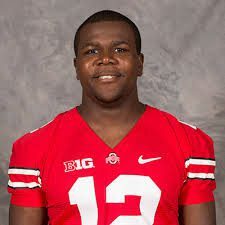 What should Cardale Jones do? Note: On NNR today David Kay joins me to talk about the Cavs and the NBA. The podcast should be up on https://fryingpansports.com/radio-show/ by 9 PM tonight. Because Cardale Jones is a redshirt sophomore he has the option to declare for the NFL Draft. The other NFL Draft Nerds are complaining that Jones doesn’t have the experience to even consider coming out. They say he doesn’t read defenses, misses open receivers, and is in a very simple offense. All of that is true. But it is what they don’t talk about that gives him the option. All Jones did was take over for the three most pressure filled games that any college student could face. He led the heavy underdog Buckeyes to the Big 10 Championship with a most impressive win. Then he led the team to a win against the top ranked team in the nation. Again the Bucks were heavy underdogs and given no chance to win by the talking heads. He finished the season by beating the 2nd ranked Ducks to take the national championship. When I evaluate a QB in the draft, I look for several things. First I want a QB that has the physical characteristics that the NFL requires. Jones has the size, arm strength and mobility that is needed in the NFL. The next most inportand thing to me is coachability. Jones by all accounts won the back up spot in the spring. But when J.T. Barrett was named as the replacement for the injured Braxton Miller, we never heard a word about Jones wanting to transfer or him complaining about the decision. That indicates to me he is coachable and a team player. In addition, he is a father and seems to have the maturity to commit himself to becoming the best player he can be. That is not the case with a certain former 1st round pick in Cleveland. The third thing I look for is the players ability to stand in the pocket and make the throw despite the pressure around him. Jones showed that in all three games. He is calm and even when he knows he is going to be blown up, he stands and makes the throw. I don’t really care about passing mechanics. That is something that few QB prospects have coming into the NFL. If a player is coachable and willing to develop his skills, mechanics can be fixed. Of course that assumes he gets quality coaching. Some teams have that and others don’t. The biggest reason that most draft analysts believe he should stay in school is that he is not able to make pre and post snap reads. But nearly every player coming from a spread offense lacks the ability to read. He will not get much better at reading defenses in the Ohio State system. At OSU the pre snap read is done by the coaching staff and the post snap read is one or two options then run. For Jones, there are several big risks going back to the Buckeyes. First, there could be a 3 man race to be the starter in the 2015 season. Coach Urban Meyer is a very loyal guy. His loyality may work against Jones in the race to become the starter next year. Second, there is no guarantee that the Bucks will get back to the playoffs let alone win it all. Jones value in the draft may never be higher than it is this year. In addition, this is a weak QB class. Jones would be a 2nd or 3rd round pick in my opinion. That would take the pressure to start day 1 off and allow him to develop his NFL skills. He is not ready to start now but has more qualities than most other QB prospects in this draft. I would tell him to take the plung and opt for the draft. He can always go to college in the off season to get his degree. That is hard for me to say because I am a big Buckeye fan.